This Zucchini Lasagna is low fat, gluten-free, Keto friendly, ridiculously delicious and only 368 calories! This lasagna uses zucchini in place of pasta thereby reducing calories. Guilt free! We’re talking lots of layers of zucchini, mushrooms, a delicious beef sauce and, of course, loaded with lots of cheese. 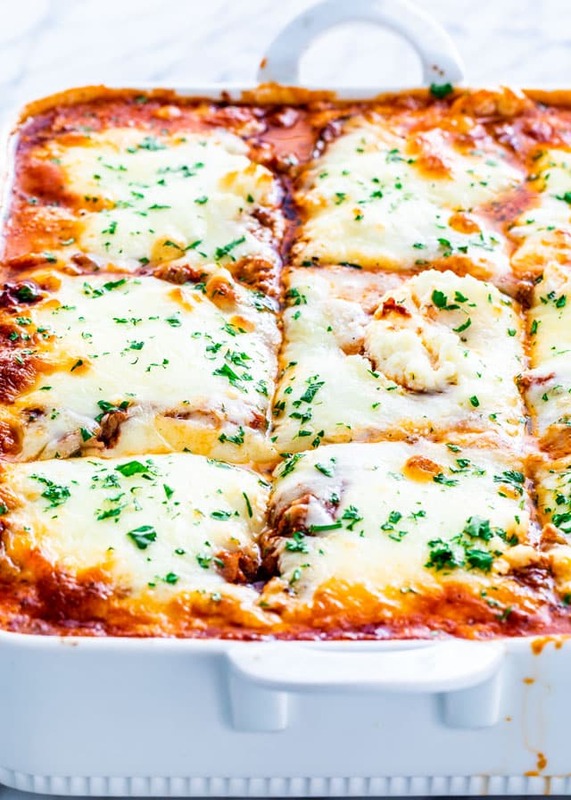 At 368 calories a serving, you can eat lots of this decadent and delicious lasagna, guilt free! Seriously! I shared this recipe with you almost 6 years ago, when I first made this with my friend. Back then, I didn’t know anything about Keto but I always did try to eat less carbs, especially at the beginning of the year. You know when resolutions of eating healthy are still fresh. So this gorgeous lasagna is what my friend and I came up with, over a glass of wine, or two. It has zucchini in place of noodles, a delicious tomato sauce with ground beef and amazing spices, mushrooms and mozzarella cheese, ricotta and Parmesan cheese. The star of this dish is the zucchini. Zucchini slices is what replaces our lasagna noodles. Lasagna noodles be gone, we don’t need you anymore! While you can use a knife to slice the zucchini, nothing beats a mandoline. It’s quick and painless. What I didn’t show you in the video, is how to get the water out of the zucchini, because zucchini is pretty watery. However, this problem is very easy to take care of. Simply lay out the zucchini slices over some paper towels, drizzle some salt over the slices of zucchini, then place another paper towel over the top to soak up all that water. You’ll notice that within a couple minutes the paper towels will be wet already. Another solution, would be to grill the zucchini slices or even bake them in the oven. 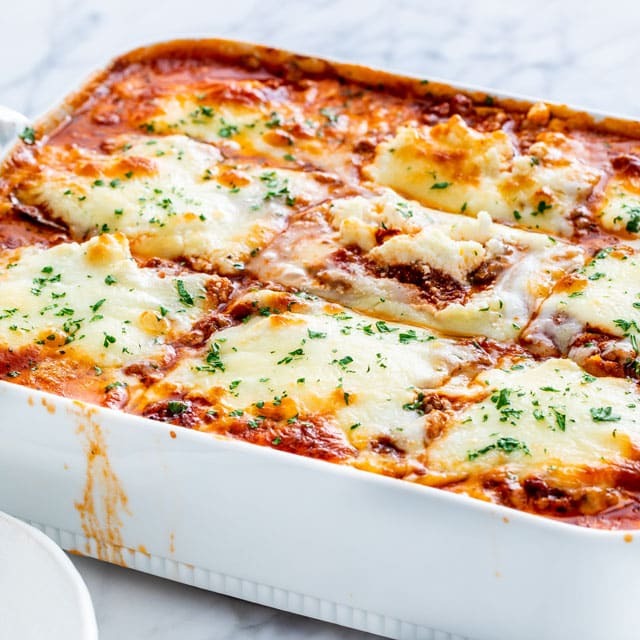 This lasagna is perfect for loading it up with veggies. I used layers of mushrooms which are great because not only do they provide lots of flavor but they are also quite meaty. Other veggies you could use are peppers, lots of spinach, onions, eggplants or even pumpkin. Use your favorite veggies, you really can’t go wrong. To make zucchini lasagna is the same as making any regular lasagna. I like to start by making the beef sauce first because it needs to simmer for about 15 minutes. While the sauce is simmering, you can prepare the zucchini as instructed. Once the sauce and zucchini slices are ready, all that’s left to do is assemble and bake. Make sure you prepare all your ingredients and they are all ready to use. 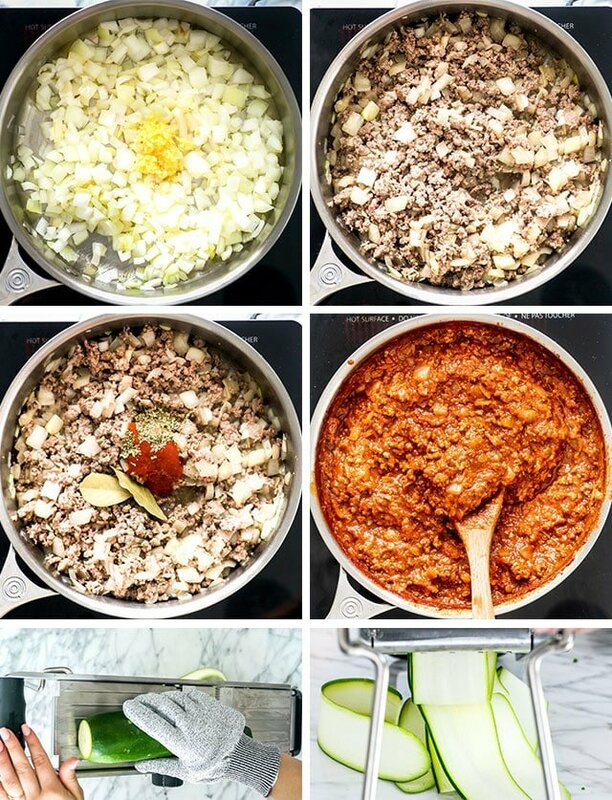 This will make your lasagna assembly super quick and easy. 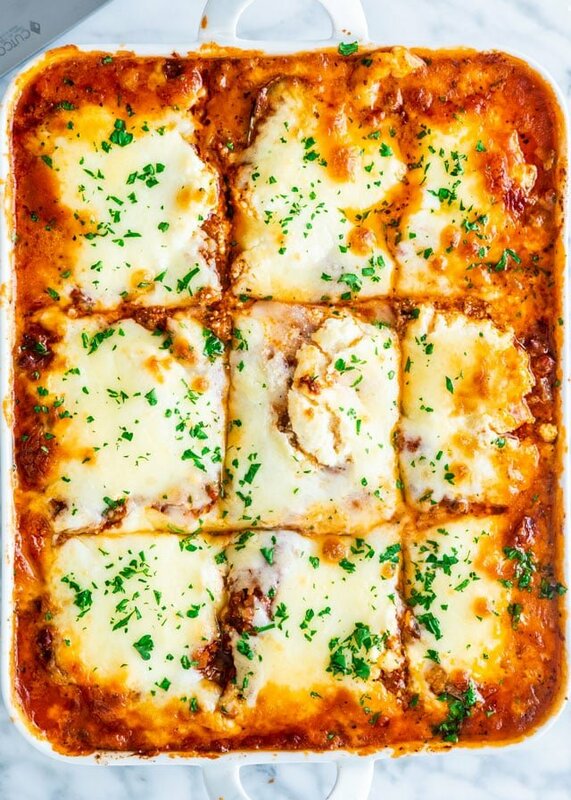 It takes about 40 to 50 minutes to bake this lasagna at 375 F degrees. Bake it until the sauce and cheese get all bubbly, and the cheese starts to get golden brown on top. 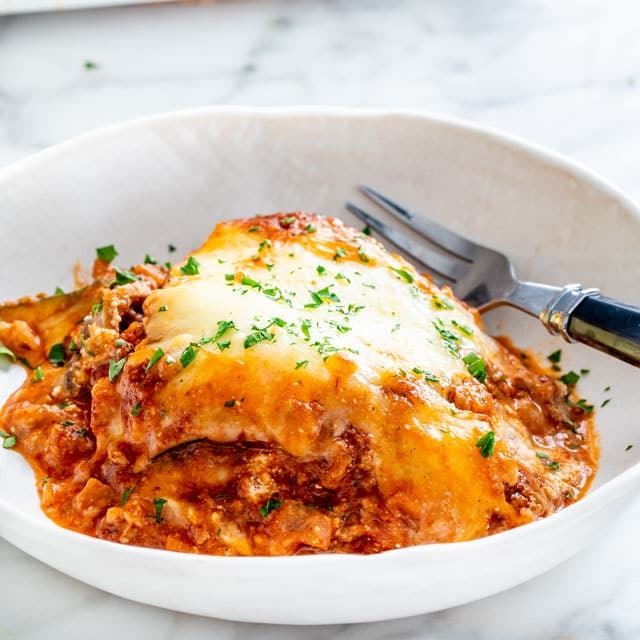 There really is no need to cover the lasagna with foil as you bake it, however you could cover it with aluminum foil for the first 30 minutes, and bake it uncovered for the rest of the time. For sure! If you’d like to prepare ahead of time, I recommend freezing it before baking it. Simply assemble the lasagna as stated in the recipe, cover it with foil or plastic wrap tightly. I also recommend placing the whole dish it in a large freezer bag, this way it will last for about 2 to 3 months in the freezer. When ready to bake, thaw out the lasagna in the fridge for 24 hours. Once it has defrosted, bake as instructed at 375 degrees for about 40 to 50 minutes. Cool the lasagna completely then cover it with plastic wrap or foil and refrigerate. It will last 3 to 5 days in the refrigerator. Yes, as mentioned above, assemble the lasagna as stated, then cover it with foil or plastic wrap tightly. Place the whole dish in a large freezer bag and freeze for up to 3 months. Make sauce: Add the olive oil to a large skillet and heat over medium heat. Add onion and cook for a couple minutes until onion is soft. Add garlic and ground beef and break the ground beef with a wooden spoon. Cook until the meat is no longer pink. Add bay leaves, cinnamon, oregano, pepper, hot sauce and stir. Cook for a couple more minutes. Add crushed tomatoes, stir and simmer for 10 to 15 minutes. Prepare zucchini: While the sauce is simmering you can prepare the zucchini, by either using a knife to slice them or using a mandoline. Slice the zucchini so they are about 1/8 of an inch in thickness. Preheat oven to 375 F degrees. Use a 9x13 inch baking dish. 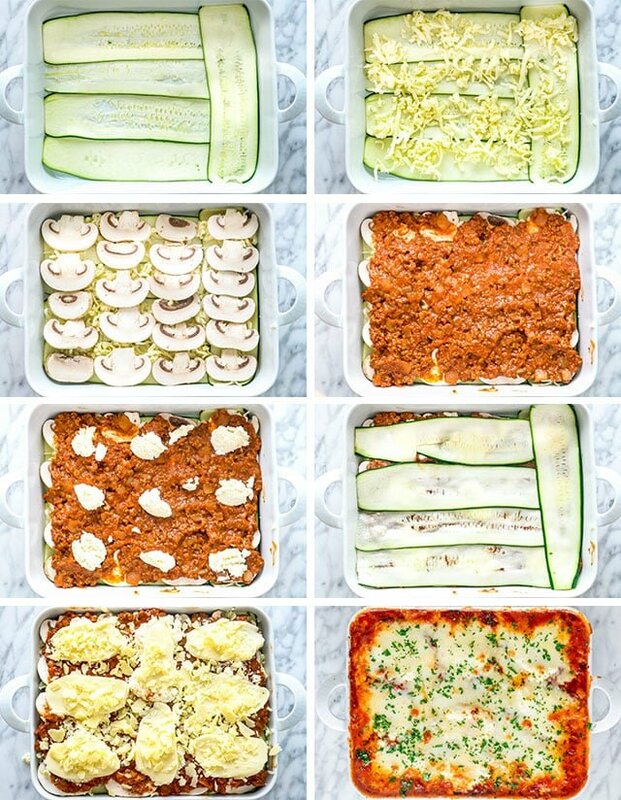 Assemble lasagna: Start with a layer of zucchini slices. Top the zucchini layer with a bit of mozzarella cheese and then a layer of mushroom slices. Next add a layer of the meat sauce, followed by dollops of ricotta cheese. Repeat so that you end up with 3 layers of zucchini. When you get to the last layer of ricotta cheese, top with shredded mozzarella or slices of mozzarella cheese. Finally sprinkle Parmesan cheese over the top. Bake: Transfer the baking Bake for about 40 to 50 minutes or until the top is starting to get golden and the cheese is bubbly. Garnish with parsley. Allow the lasagna to sit and settle for about 10 to 15 minutes before slicing into it and serving. Notice I did not add any salt. Usually I don't add salt when cooking with lots of cheese as the cheese is salty enough, but feel free to season with salt as preferred. I made this using fat free small curd cottage cheese in place of the ricotta. It was amazingly delicious! Thanks so much for a dish without pasta noodles! Thank you Jo love your recipies✨😘💕 you are awsome! Do you peel your Zucchini for the lasagna? I have this in the oven right now! I can’t wait to try it. Found this. Made it. Excellent. Although, I had to bake it for about 1.5 hours to make sure it was cooked through. When I took it out there was some excess liquid, but after about 30 mins it stiffened up nicely. Great way to use up the mass abundance of zooks in my garden! Jo, going out now to buy the ingredients-looks simply delicious and zucchini is in season. Just a question your oval glass baking dish looks higher than any casserole dish I have, can you give me the dimensions and brand name. I’d like to put that on my wish list. It’s Arcuisine France and you can find it on amazon here. This recipe is so tempting…looks delicious! The cinnamon and Frank’s hot sauce are throwing me off a bit, however. How do you think the lasagna would be without these two ingredients….or a better way to ask…what do you think they add to the outcome? Delicious… Can this be frozen? I don’t see why not. I’ve never tried it though. This lasagna is off the hook! It looks amazing! I pinned it AND shared it with my fb friends at https://www.facebook.com/JaseysCrazyDaisy!!! LOVE LOVE LOVE IT! Thanks Jasey!!! Really appreciate it! 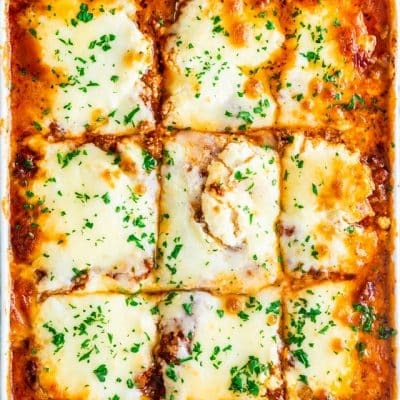 I have been staying away from pasta and in general I really have not been missing it (thanks to the discovery of zucchini ‘noodles’) but I do miss lasagna – I cannot wait to try this dish. Fabulous! I bet you’re not going to miss the noodles in this lasagna! You can sprinkle the zucchini with salt and leave it sit on paper towels just like you would for eggplant, to drain the excess moisture. Just squeeze them in the paper towels before using in the recipe. Thanks Kari,I was afraid it was going to come out a bit too wet, but it wasn’t too bad. Looks delicious – Thanks for the post! I think you could skip the mushroom, they were an after thought, had some in the fridge and wanted to use them.